The celebrated host of over 2,000 cooking shows, Martin Yan enjoys distinction as a certified Master Chef, a highly respected food consultant, a professional instructor and a prolific author. He expresses his diverse talents in 26 cookbooks, including the award winning Martin Yan’s Feast, Martin Yan’s Asian Favorites, Chinese Cooking for Dummies, Martin Yan’s Chinatown Cooking, (intro by Julia Child) and Martin Yan’s Quick & Easy. Born in Guangzhou, China, Yan always possessed a passion for cooking. His formal induction into the culinary world began at thirteen, with an apprenticeship at a renown Hong Kong restaurant. Training at Hong Kong’s Overseas Institute of Cookery followed. While pursuing an MS in Food Science (University of California/Davis, USA), he taught Chinese cooking for the university extension program. In 1978, he pioneered a Chinese cooking TV show: the now classic “Yan Can Cook.” Infused with his characteristic warmth, humor and vitality, the show quickly won a worldwide following. The format expanded to include distinct styles of Asian cooking, with Chef Yan traveling to culinary hot spots to introduce viewers to local food and customs. A popular guest-instructor, Yan also taught at the California Culinary Academy, Johnson & Wales University, The Chinese Cuisine Institute in Hong Kong, The Culinary Institute of America, the University of San Francisco and chef training programs across North America. In 1985, he founded the Yan Can International Cooking School. His Yan Can and SensAsian Restaurants offer inventive pan-Asian menus and give competitors a run for their woks. Internationally recognized as a Master Chef among his peers, Yan has been nominated for the 2004 James Beard Award and Best National TV Cooking Show Award. 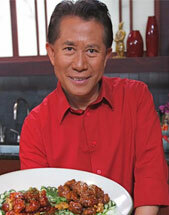 His TV series, “Martin Yan’s Chinatowns,” won a Telly Award in 2004. The companion book was cited by Newsweek as one of “The Year’s 10 Best Cookbooks.” In 2002, Chef Yan was honored as “California Chef of the Year” and named an Honorary Chairman of The International Association of Culinary Professionals Foundation. In 2001, Yan was inducted into the James Beard Foundation’s D’Artagnan Cervena Who’s Who of Food and Beverage. Honored with the prestigious Antonin Careme Award, the Courvoisier Leadership Award and membership in Les Disciples D’Auguste Escoffier, he was named Trustee of Copia and Culinary Diplomat for the American Culinary Federation (along with fellow chef Paul Prudhomme). TV credits also include a 1998 Daytime Emmy Award, a 1996 James Beard Award for Best TV Food Journalism and a 1994 James Beard Award for Best TV Cooking Show. He received an Honorary Doctorate Degree in Culinary Arts, (along with America’s First Lady of cooking, Julia Child), from the world’s culinary training mecca, Johnson & Wales University. In 1999, the Colorado Institute of Art conferred an Honorary Doctorate Degree in Humane Letters upon him. He has captured the attention, admiration and hearts of millions of cooking fans by spicing his cooking artistry and teaching with a personal ingredient: wit. Via television or in person, a cooking session with Chef Yan proves invigorating as well as educational. He is dedicated to dispelling the mysteries of Asian cooking, and furthering an understanding of the cultures that created these cuisines, with spirited fun and entertainment.